Android is known as the favorite mobile OS for developers, because anybody can upload their app to the Google Play Store without doing a lot of hard work. This surely is good for the evolution of this field as more and more people will try to make their own applications, but at the same time, it presents a constant security danger. The open doors at the Play Store allow hackers to promote applications that have malware. The operating system itself will protect you up till the point when you accept the terms of a certain malware rich application. After you install a false application you are vulnerable to attacks that can corrupt the safety of your android mobile data. In order to prevent this event you will need one or couple of the Android data security apps. The mobile device is becoming an essential part of our personal and professional life. That’s why the number of functions that it can finish increases each year. You are communicating with your friends through SMS, send and receive mails, schedule appointments, pay your bills, check your airplane tickets; all through your mobile device. All of this data is stored on your mobile device for further use, or in the type of history files. This means that if hackers succeed to overcome the security breach of your phone, they can take advantage of your most important information. That’s why mobile data protection is so important. Data protection is a system that will protect the integrity and safety of all your personal information. 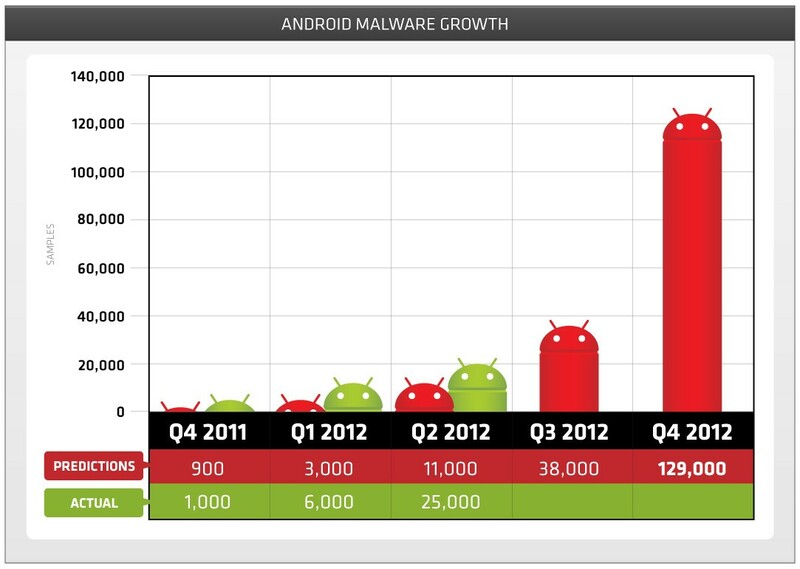 Bellow you can see an example of how fast did the number of malware application increased during 2012. The Google Play Store has rapidly increased the number of apps on their store. It seems like mobile developers that work on Android, just love to create apps. With its growing pace Google Android Market has become the largest app store out there, compared to its direct competitors Apple App Store. This is happening also because the Android market for applications is more open, and it allows anybody to add their own application. As the number of apps grows in the store, the number of apps filled with malware is growing even faster. Android is always trying to detect false applications using various techniques, but there is always the risk that something is going through their filter. This leaves your mobile device vulnerable to hacker attacks connected with phishing. Another market is emerging because of this situation and that is the Android data security apps market. Many developers produce free Android data security apps because there are many other ways to monetize an app rather than subscription fees. Nevertheless there are some differences in quality between paid and free Android data security apps. Free app that offers both malware protection and provides browsing safety. It doesn’t feature a spy cam, but at the same time you can take advantage of a very useful anti-theft online platform. It is filled with useful features that will give you everything you need when it comes to mobile device security. It may be somewhat confusing for inexperienced users. One of the most useful options is probably the call and SMS filtering, which can come handy from time to time. 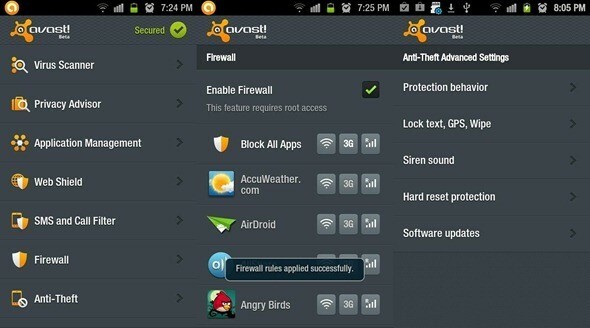 You can download Avast free mobile security app from Google Play. 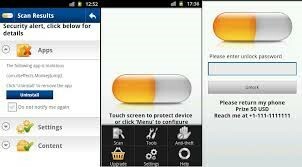 This free Android antivirus app is the part of a trilogy of mobile security apps from the same brand. The free version of AVG Mobilation Antivirus has tons of features available, and it can prove to be very useful for novice users. For all of those that want to add the app locker, data backup and support; will need to purchase the pro version valued at $1.99, which can be bought at the Google Play Store. The same price goes for all users that want to run the app on their tablet. Nifty little app that always runs in the background and doesn’t affect the performance level of your device. The design of the home screen can be little confusing at beginning. 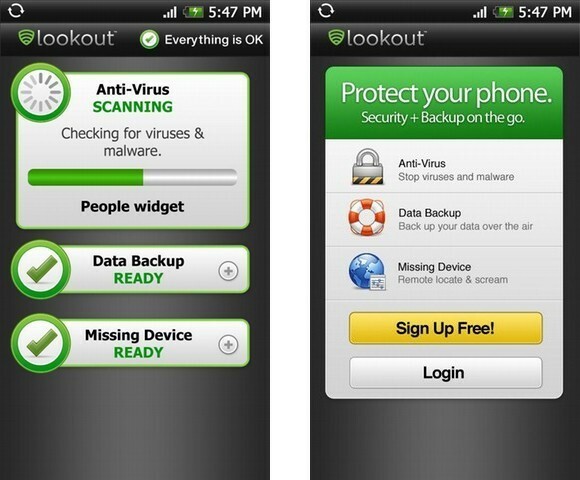 The Lookout Mobile Security Android software app will offer you with free contacts backup, malware protection, and remote theft protection. Yes, this is all a part of the free version of the app. If you need to use additional security features like add phishing protection, media backup, transferring data to your new phone and 24/7; then you can upgrade to the Pro version that has a price tag of $2.99 per month. 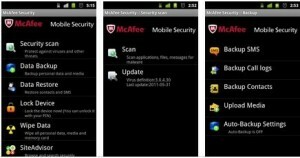 McAfee Mobile Security is ranked amongst the top Android data security software apps on almost every review page you will find on online, and there is a good reason for this. Its malware detection test results showed 99.6% accuracy on a sample of over 1900 types of malware. This is well above the average 95.2% in the industry. Although it is highly accurate it needs lots of time to conduct a full device scan. Compared to Bitdefender’s ten seconds, the McAfee Mobile Security Android app needs more than four minutes to detect all of the malware located on your device. You will need to invest $29.99 in order to get this highly customizable security app, on which you can find occasional bug or two. It tops McAfee for a little when it comes to malware protection accuracy, 99.7% on the AV-test. It also scans the device pretty fast and doesn’t affect the speed of your phone. You would think that it is even pricier than other similar Android antivirus apps, but the truth is that you can get the Kaspersky Mobile Security app for Android for only $14.95 at the Google Play Store. It is maybe not so easy to navigate through this app, but when compared to its pricing and the protection that it provides its probably one of the best choices out there. 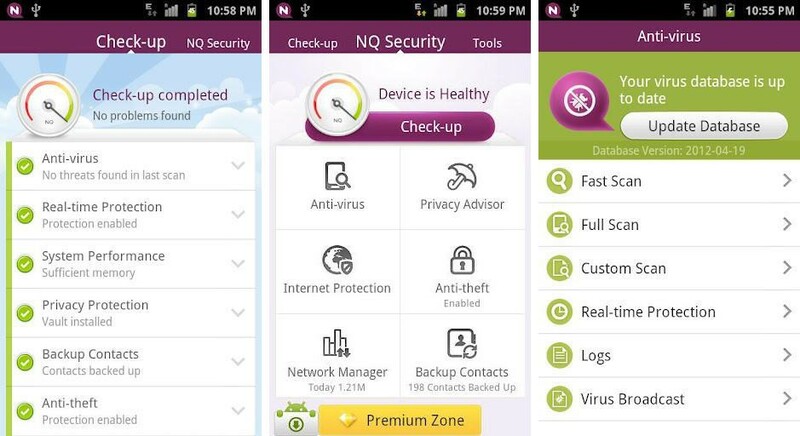 NQ Mobile Security and Antivirus doesn’t come from a top tier software company like Kaspersky or McAfee, but it is still a pretty decent application for this purpose. It will detect more than 90% of the malware that is located on your mobile device and it will do that fast. The subscription for the usage of the app is $19.99 and there are couple of other options that are not included in the plan like the Easy Finder and the Vault. Mobile security is a field that is evolving pretty fast and that’s why it is hard to find some hidden free Android security applications so easily. Most of people tend to thrust already proven names in the security industry. That’s why we would like to hear if you had any experience with some of these apps and how you would rate them. Also if we didn’t take into consideration some quality app that needs to be on the list, feel free to comment.